One obvious time you can hear the line “another fine mess” is when Beverly and Bettymae Crane step in front of the camera in their dazzling pageboy costumes and introduce the film Another Fine Mess. In order to do that, they must speak the line on camera. . . and thus the phrase “another fine mess” has actually been spoken in a Laurel and Hardy film. Another time we can hear the phrase “Another fine mess you’ve gotten us into!” is in On the Wrong Trek, a 1936 Charley Chase short in which Stan and Babe make a cameo appearance. After Charley has made an ill-advised blunder by pulling off the road to help some would-be accident victims that turn out to be robbers, Charley’s charming mother-in-law (Bonita Weber) actually utters this line. So yeah, I’m cheating. 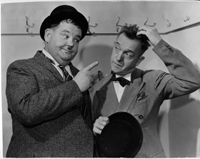 The line was spoken twice in a Laurel and Hardy film, but never by Ollie…right? Ollie did have several variations of the line that were used in the films. In Thicker Than Water, he laments “Here’s another nice kettle of fish you’ve pickled me in.” In Saps at Sea, it became “Here’s another nice bucket of suds you’ve gotten me into.” One time Stan even finishes the line for Ollie in Chickens Come Home: “Here’s another nice mess I got you into.” One of Ollie’s strangest variations of the line, “Here’s another mess you’ve gotten me into,” goes virtually unnoticed in Babes in Toyland. So the million dollar question is: did Oliver Hardy ever say “This is another fine mess you’ve gotten me into?” Indeed he did…but not in a film. It was in the radio program “The Wedding Party,” broadcast as part of the Mail Call radio program in 1943. Just after Patsy refuses to marry Stan (in retaliation for his refusal to marry her earlier in the program), the Justice of the Peace (Edgar Kennedy) blows his stack. Ollie advises the couple that they had better get out of the Justice’s home. Once they are outside, he recites the aforementioned line exactly as quoted. 2 Responses to Another What Mess? The ironic thing about that line in the radio program was that the sketch was written by Stan Laurel himself. 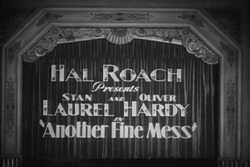 Even though Ollie had never said “fine mess” himself in any of their films, Stan wrote it that way for the radio sketch, and Hardy read the line as written. I guess that shows how easy it is for us to get details like that wrong. Even Stan himself remembered it incorrectly. I suppose that most people remember it as “fine mess” because that’s the title of a Laurel and Hardy film. I wonder who actually put the title on that film- since it was announced by the girls delivering the spoken titles, I suspect that it was H.M. Walker, but it’s very hard to say for sure who named that film. I was watching the silent movie ” Sugar Daddies” today and noticed that the subtitle has Oliver saying to Stan, ” A fine mess you’ve started!” Perhaps this is the earliest appearance of any version of Oliver’s famous catch phrase , and in this case he did say “fine mess” rather than “nice mess” in a film.